Hi. I love the colours you used today. I also like forest moss. I like how yellow bleeds out of it when I use the stain on wet paper. I like blueprint sketch and aged mahogany as stains. The aged mahogany seems much more brown as an oxide. 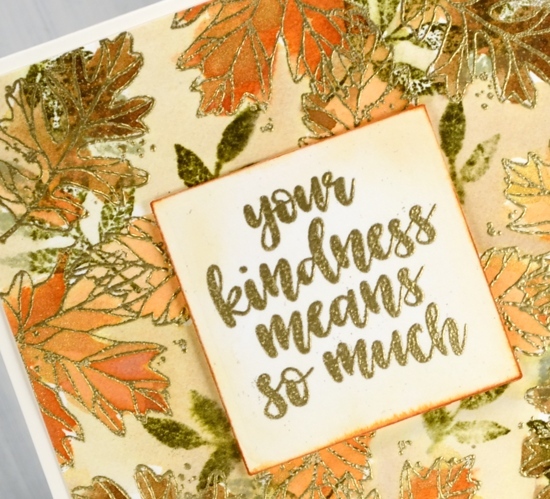 If you are still doing thanks, I’m grateful for Tim Holtz! Yes, I love the colours that separate into different pigments. Memento ‘northern pine’ does that in a way that is beautiful for pine trees. Thanks for the autumn inspiration for something different with a set I love. It is a fun set and I quite like the mix of solid and outline images in it. 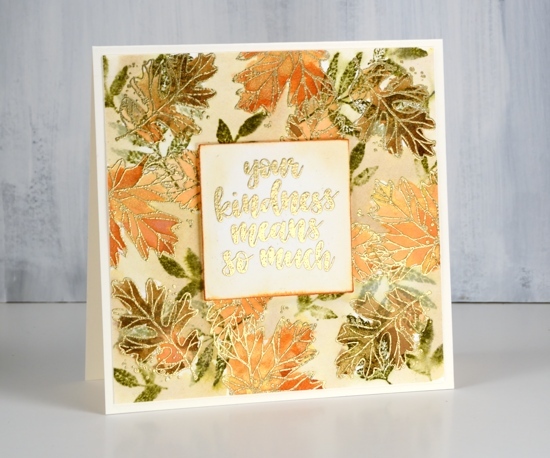 What a beautiful Autumn card! Today the colors you chose are my favorites – seriously, my faves can change on any given day! Yes, my faves change too, or perhaps my list just expands! Beautiful card. Thank you, Heather, for teaching me so long ago about Forest Moss for my leaves’ most natural color. Forest moss is my green in the distress inks and Northern pine in the memento inks! Stunning card, Heather! Like Christine, I too am thankful for the creative genius of Tim Holtz. Mowed lawn, iced spruce and peacock feathers are among my faves, along with the ones you mentioned! Thank you Mary Ann. Yes,despite their funny names I think the distress colour range is very good. Thank you Pat for your kind comment. I was surprised how much I liked crushed olive when I bought it and of course with a name like salty ocean I knew I would like that one! What a beautiful card, Heather! 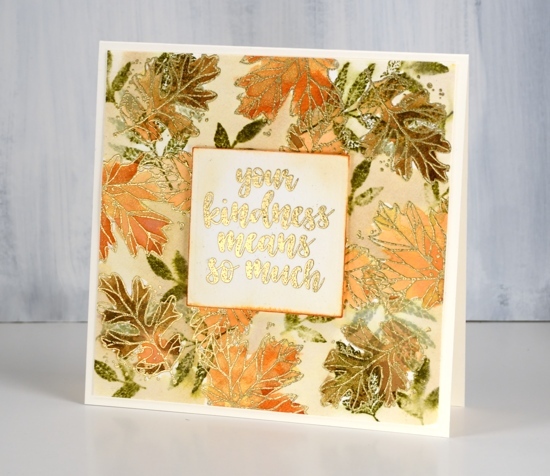 Your leaves are painted so beautifully and I love the gold embossing that makes this card so elegant! I think I use Peeled Paint, Mustard Seed and Picked Raspberry more than any of the other colors but there are so many beautiful shades that it’s hard to choose! Love your beautiful autumn leaves. Wonderful coloring. This is wonderful. Those glimpses of gold make it look like a pile of leaves in a jewelry store. So much to entice the eye.